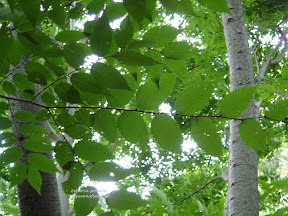 The Zelkova serrata is a non-native, but it is one that you are seeing more and more across the country. It is hardy zones 5- 8, quite adaptable to many urban type settings. In Michael Dirr's Hardy Trees and Shrubs the Zelkova is listed in the back for drought tolerant trees, handling compacted soils, heat tolerant, and ideal for street / urban planting. 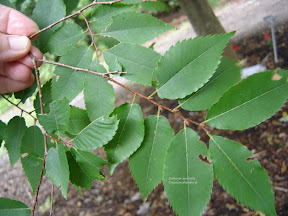 Many landscapers are using it more in place of the American Elm as it has more resistance to the Dutch Elm disease. 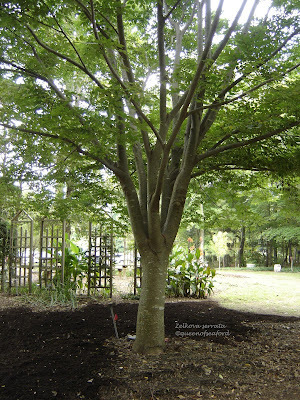 As a mature tree the Zelkova will be a large tree, height ranging from 60- 90 feet tall with a spread of up to 40 feet. The growth habit has the limbs forming a tight vase. In order for this tree to maintain its nice shape and be a healthy tree proper pruning techniques need to be followed. The limb crotch angles are tight and one should prune to keep the center of the tree open. This sample of the Zelkova is in the Learning Garden and has been pruned for the last number of years with an eye on keeping the vase shape open and room for the limbs to mature. 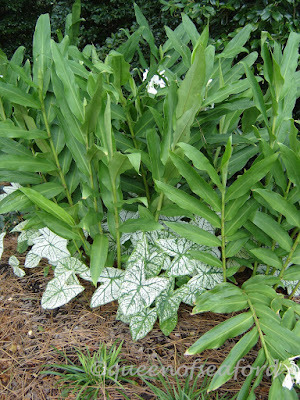 The 2- 5 inch alternate leaves are dark green and serrated. In the fall this tree really shines. 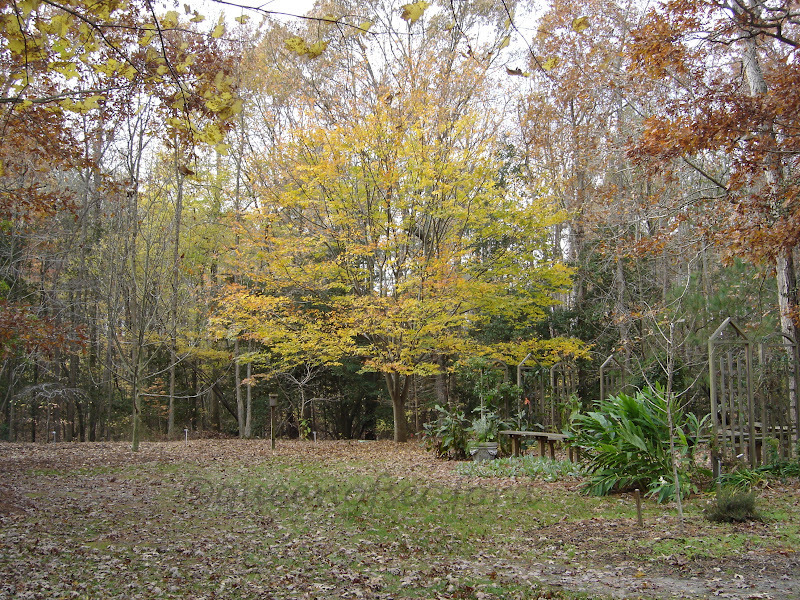 The fall colors range from yellow to red to purple. The bark is grey and smooth with numerous lentils and some exfoliation. Some further reading on this tree include North Carolina State, Virginia Tech, UCONN, University of Florida, and MOBOT. I have mentioned this plant a few times earlier this year but wanted to share it in multiple stages. 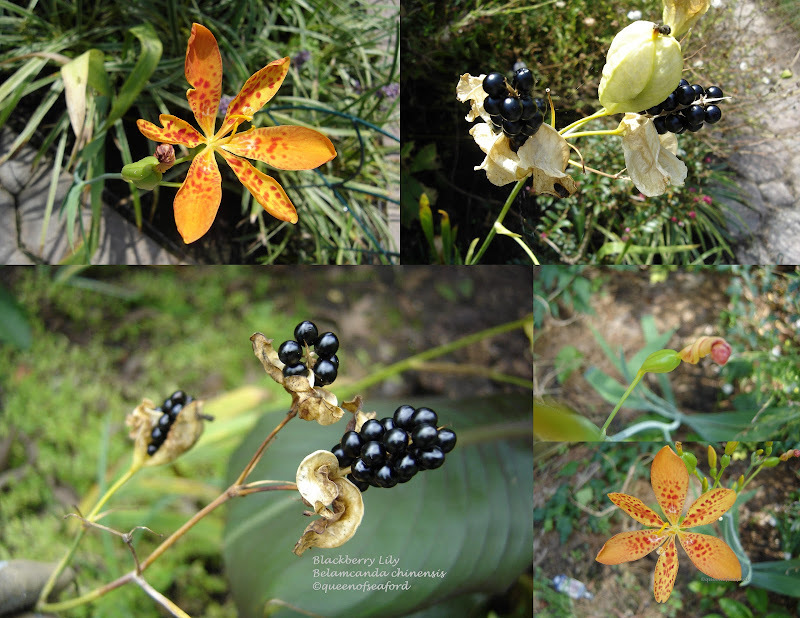 One can truly see the blackberry in the Blackberry Lily. Belamcanda chinensis - the seedpod certainly looks like a blackberry! The recent rainfall lends itself to some nice photo shots. 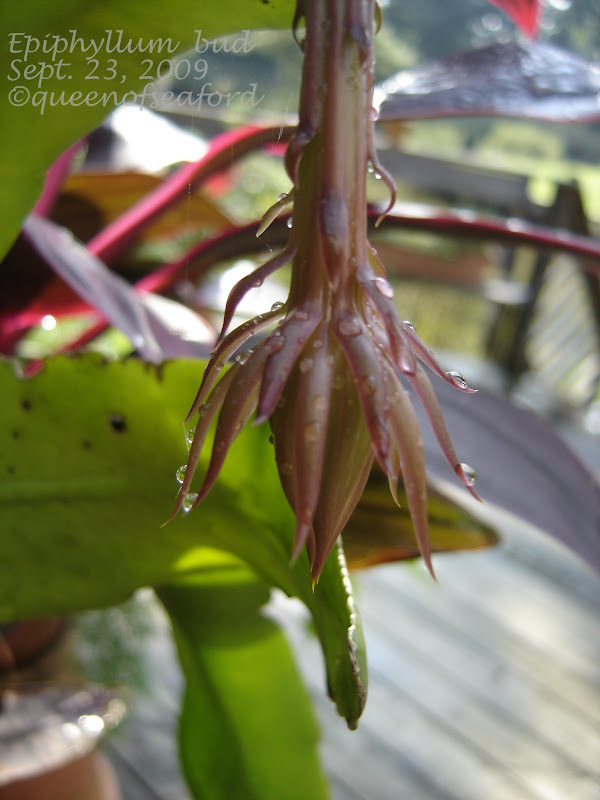 I love the raindrops hanging off the ever-maturing bud. 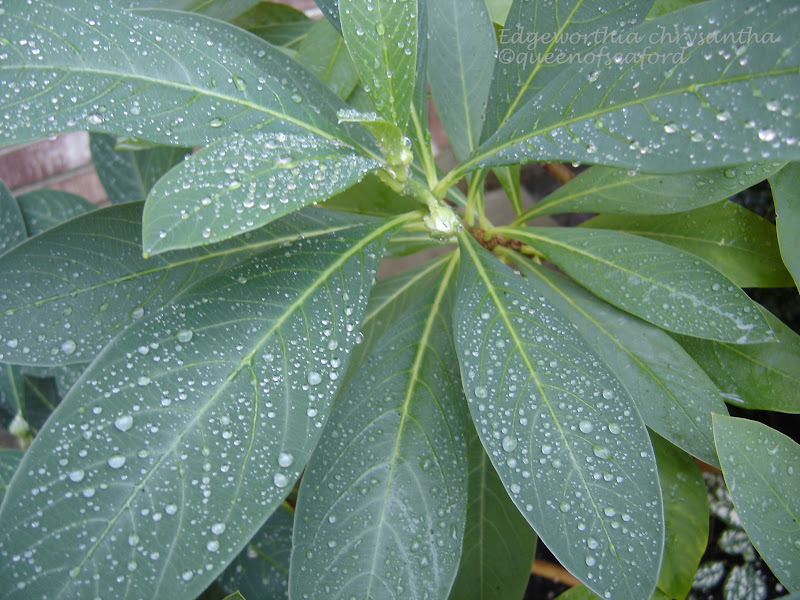 And the droplets beading up on the Edgeworthia...the large leaves are almost like velvet. 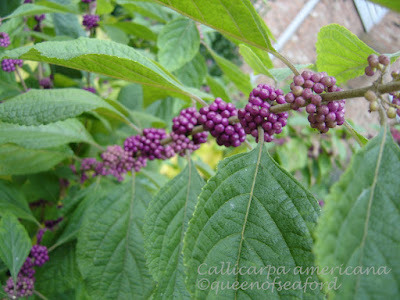 Two of the shrubs in my garden that shine this time of year are the two different Callicarpas. I bought a Callicarpa at a native plant sale and it turned out to have smaller leaves and smaller berries. 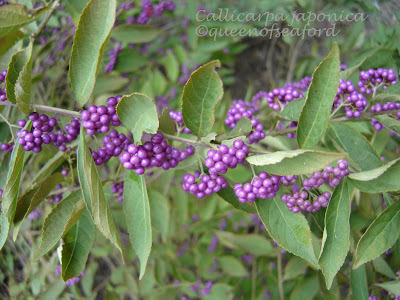 Further investigation proved it to be the Callicarpa japonica (that they were also selling, this was mislabeled). 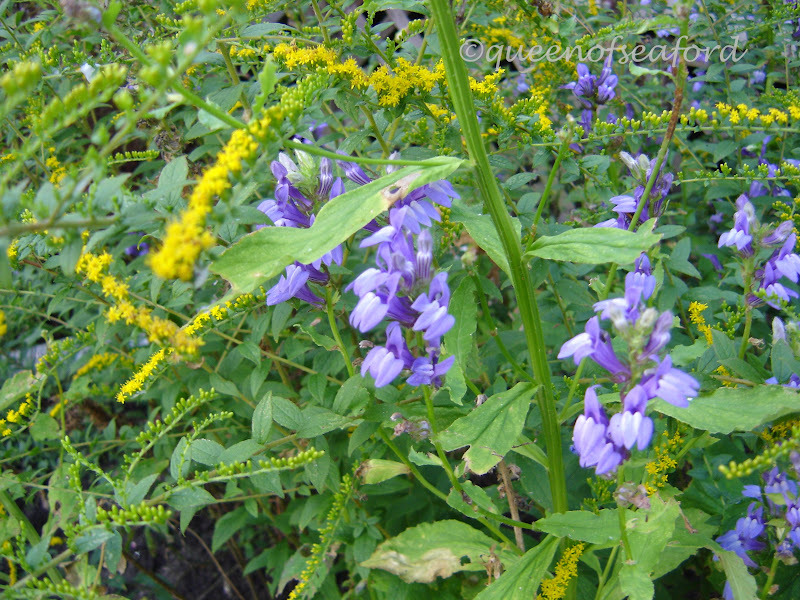 As you can see the americana variety has much larger leaves and the berries are larger and a little different shade of purple. 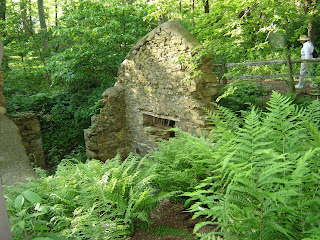 These shrubs are edge of forest/ dappled sunshine loving plants. Mine have been in ground since 1999. About 4 years ago my neighbor had her pines taken out...about 5 or 6 large Loblolly pines. Since then, this section of my garden is in full sun and the Callicarpa seem to be doing just fine. Every other winter I cut them almost to the ground. As mature shrubs they are about 6-8 wide and about 5- 6 feet tall. 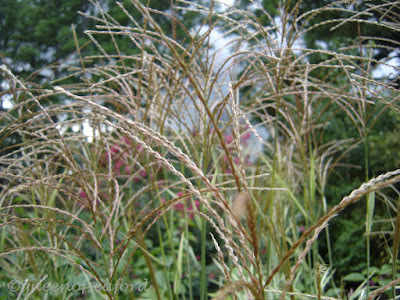 The Miscanthus sinensis 'Dixieland' is in bloom now... thought the dark skies through the seed heads was a good backdrop. And now for the mystery. My sister suggested I do this in the form of a contest, though I am not sure how to prove one right or wrong... here is a 'volunteer' plant in my backyard. I never planted this plant, no one in the area grows this plant, soooo........HOW DO YOU THINK IT GOT HERE??? Know what this is??? A peanut! Arachis hypogea. But how...??? Sweetbay has IDed this as a Cassia obtusifolia which looks amazingly like a peanut. Still a mystery as to how it got here. A little humor for the evening post viewers..... 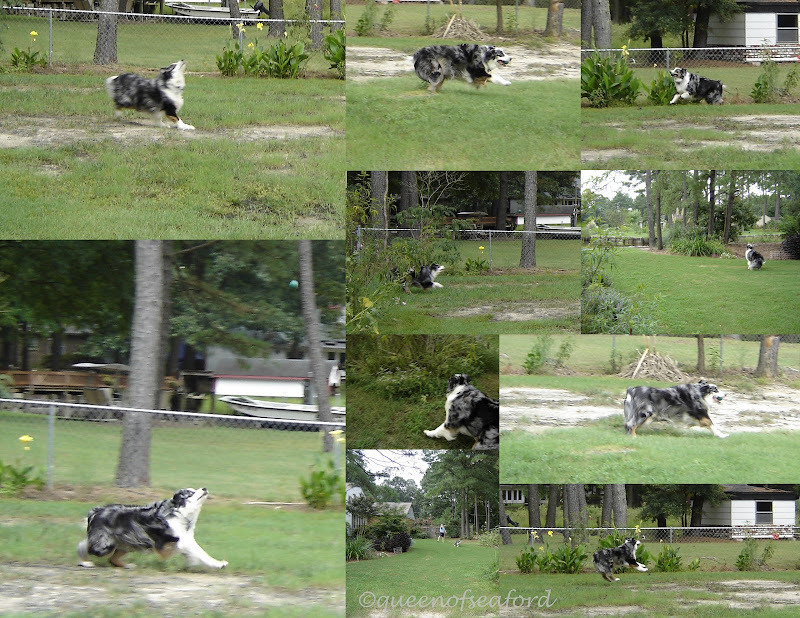 If I throw the ball for too long of a time Skyler gets overheated. He will take matters into his own 'hands'. For all who are members of Blotanical.com, the voting is now open to choose from the top 5 in all sorts of categories. Thanks to all who put me into the top 5! 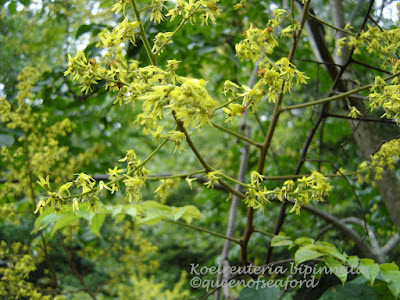 ps- I found I had a photo of the Koelreuteria bipinnata with the fall pink pods...so scroll down to see another photo in the posting. *Note- update on the Littleleaf Linden post—Les I still believe you have a Littleleaf. 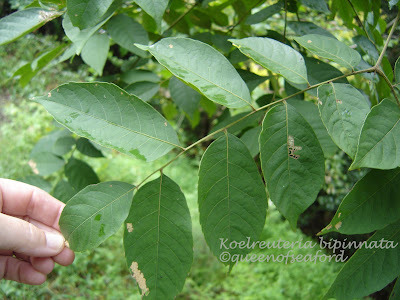 The Koelreuteria bipinnata (kole-roo-TEER-ee-uh bye-pih-NAY-tuh) is one of three Koelreuteria from Asia and is a small to medium sized tree. 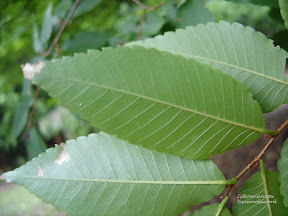 The leaves are bipinnate which means that it is a pinnate leave where each leaflet is then pinnate as well. See my very poorly drawn diagram. 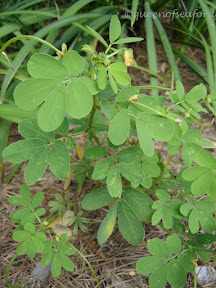 The leaflets are alternate, a dark green serrated ovate. Common names for this tree are Bougainvillea Golden Rain Tree or Chinese Flame-tree. 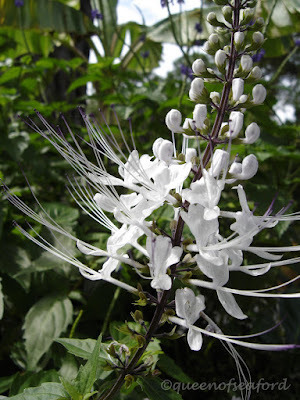 It has a spreading shaped growth habit, reaching heights 40- 60 feet. It can also be seen as a multi-stemmed specimen. 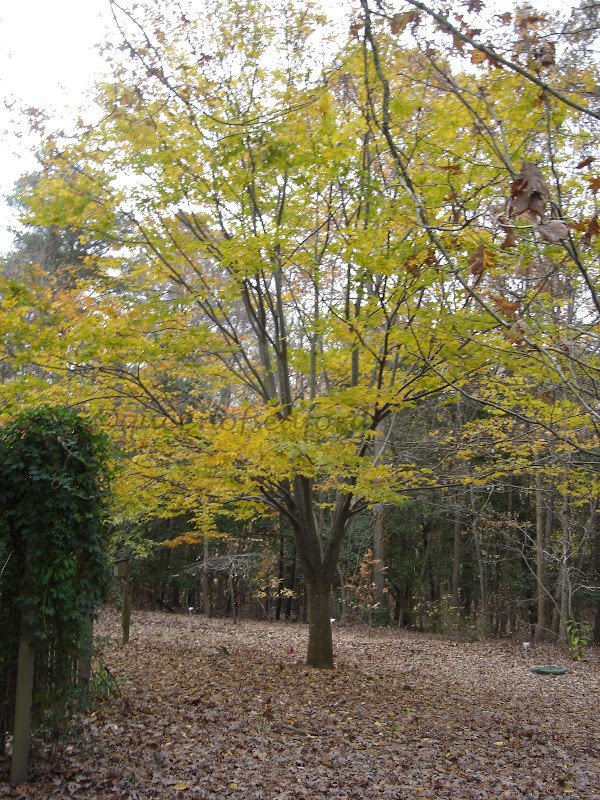 It is throughout the South, hardy to zones 7- 10 and is a good neighborhood tree. 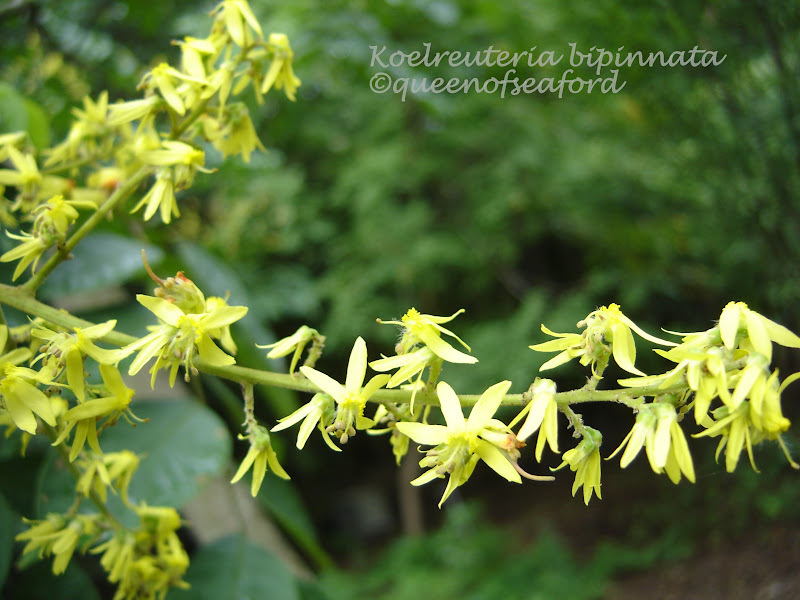 The yellow flowers appear mid to late summer on terminal panicles and are fragrant. Later two inch long 'Chinese lantern' shaped paper husked seed pods appear. These pods are pink and retain their color after drying. (Some use them in flower arranging) The leaves are yellow in the fall and with the pink lanterns make a very nice addition to the fall landscape. This tree is self pollinating and can produce fertile seeds that will germinate. Some areas are looking at this as a possible invasive tree. 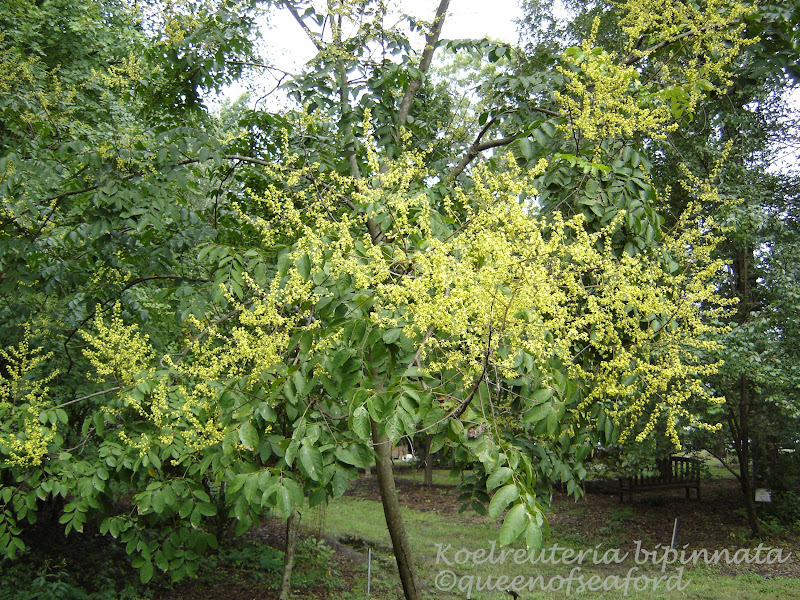 We have this tree and the Koelreuteria paniculata in the Learning Garden and there are small seedlings in the area of these trees. They are easily pulled. Not sure why, but the paniculata didn't bloom this summer (or I missed it, which is unlikely). 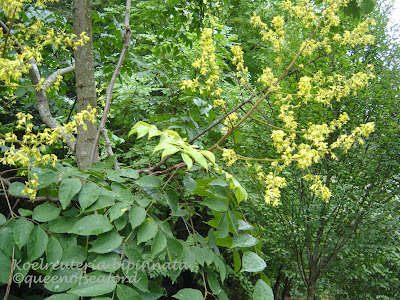 The bright yellow flowers are striking against the dark green leaves and this makes it a very nice specimen tree in the landscape. Here are three places with more information about this pretty tree. Henderson State University , University of Florida and North Carolina State . 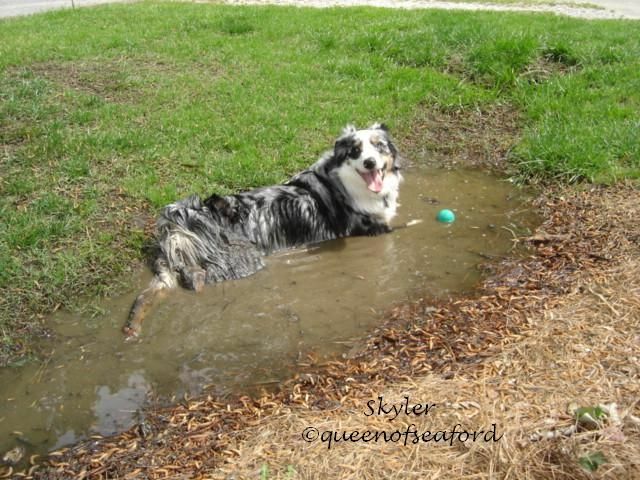 Sorry about the lateness in posting this ---an old senile dog last night wanted in and out and in and out and in and out….hard to concentrate. 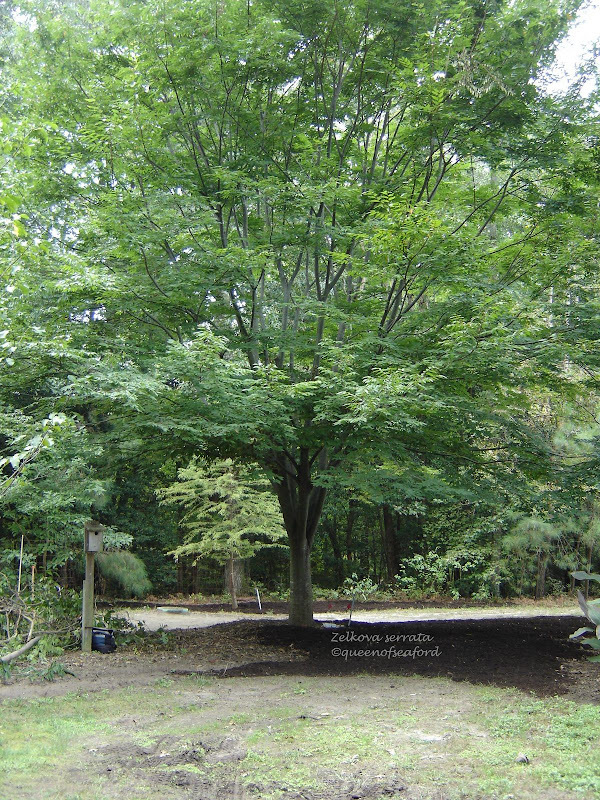 Next week's tree is the Zelkova. Yesterday Racquel and I went drove over the water (rather under the water, Hampton Roads Bridge Tunnel) to Norfolk to visit Les in his garden. What a great day! Les has a small garden but it is filled to the brim with interesting plant material. 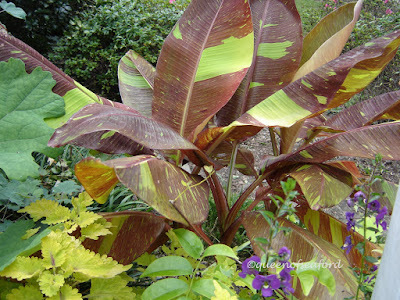 At his front walkway you are greeted by the Red Banana paired with Coleus. On the other side of the front steps is another Coleus 'Alabama Sunset' paired with Jasminum officinalis, a hardy jasmine with wonderful golden foliage. His backyard has some of the most interesting plants. 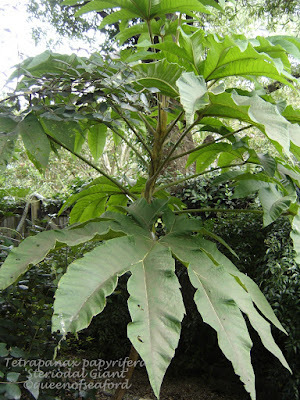 One of these treasures is Tetrapanax papyrifera 'Steriodal Giant'. This plant looks prehistoric. In his backyard is a Linden tree…which I was sure was a Littleleaf Linden, but after seeing a tree with small leaves at the Botanical Garden later in the day labeled Tilia Americana, now I am not so sure. More studying is in order! 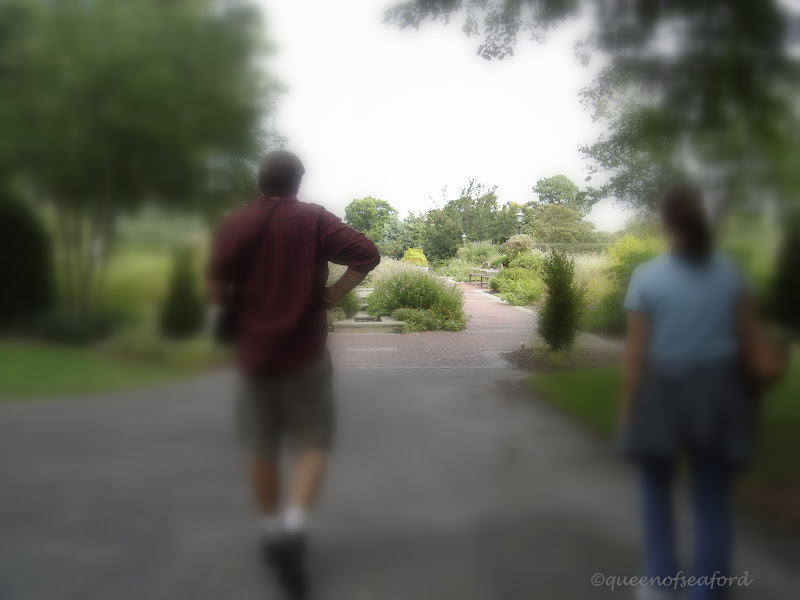 A short drive from Les' house is the Norfolk Botanical Garden. 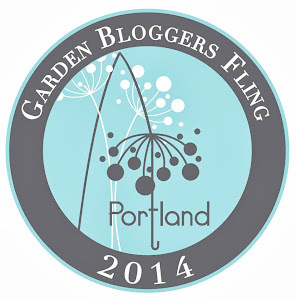 Both Les and I had blogged about this garden in the spring when the Camellias were blooming. 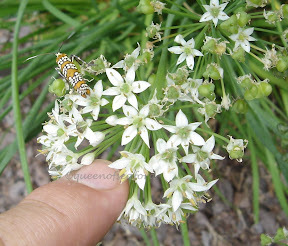 We strolled around the garden and had so many great plants to take in. 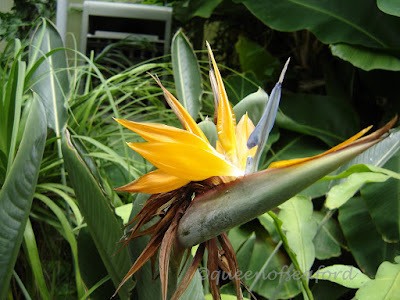 I was especially happy with this photo of the Bird of Paradise in the Tropical Display House. There are so many unusual specimens. 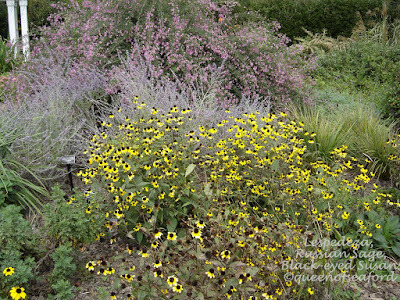 From the Tropical Display House we ventured out in to the Sarah Lee Baker Perennial Garden. It was as if we were walking into a dream…..a gardeners dream! 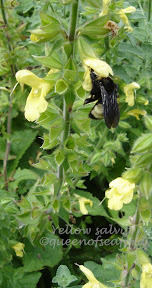 There are blooms galore and some interesting insects to boot! 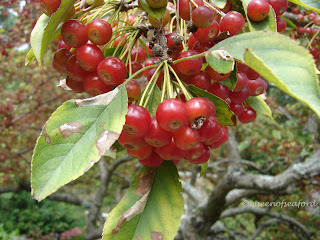 These berries are from a wonderful old crabapple tree. 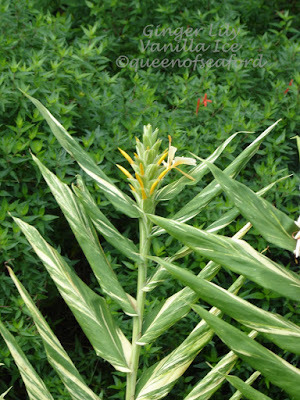 The variegated Ginger lily is very sculptural. 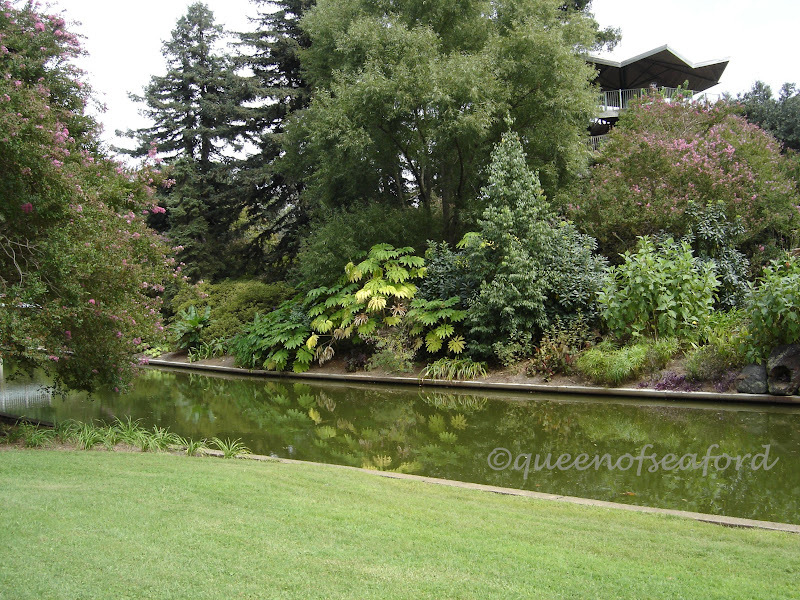 Look across the waterway, see the Tetrapanax like Les has in his yard? Here is a dilemma for you…sun or shade? 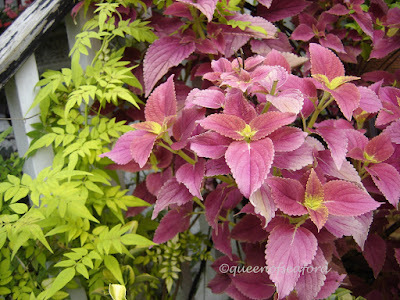 I was intrigued with this pairing –the Ginger lily needs sun and the Caladium are shade lovers. Both seem to be very happy under some very mature trees. Perhaps there is enough morning sun. 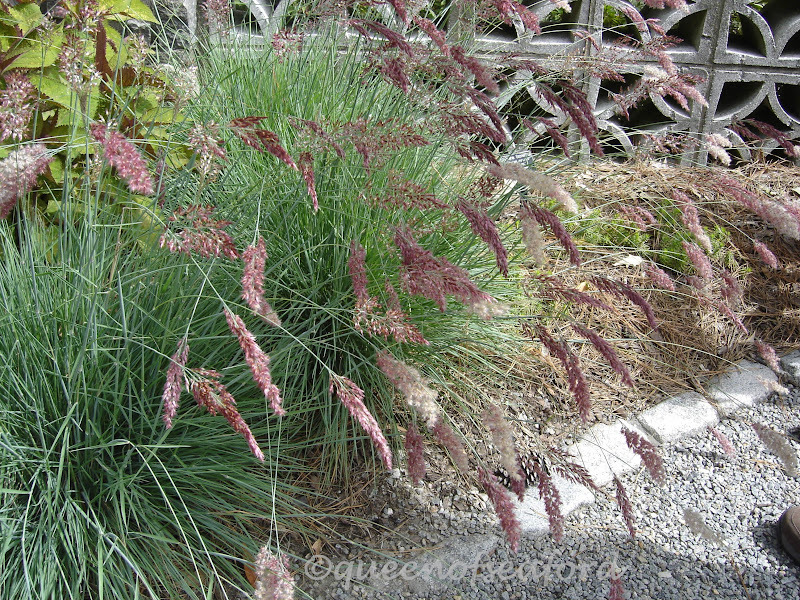 Too bad I already offered my ornamental grass photo for the contest…here are two nice combinations. Jan at Always Growing shared Cat's Whiskers a little while ago…I was happy to see them in person. I love the tips with a touch of purple on the ends. It is a member of the mint family. It is listed by Jan as Orthosiphon aristatus. The rose garden is in full splendor – each rose is prettier than the next. 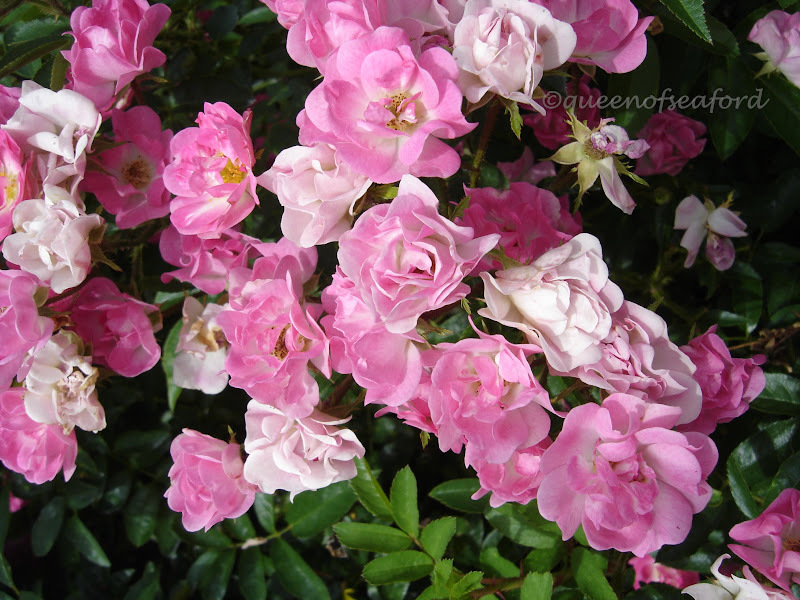 I really like this one with so many variations of pink on one bush. Of course we couldn't find a name for this one though we think it is one of the Fairy Rose cultivars. 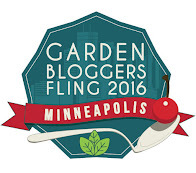 What a great time walking through the gardens with a couple other plant lovers. It was a nice time getting to know both Les and Racquel a little bit better. 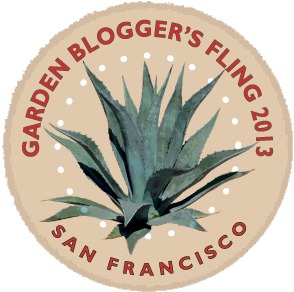 We will have another mini-blogger get together again soon. 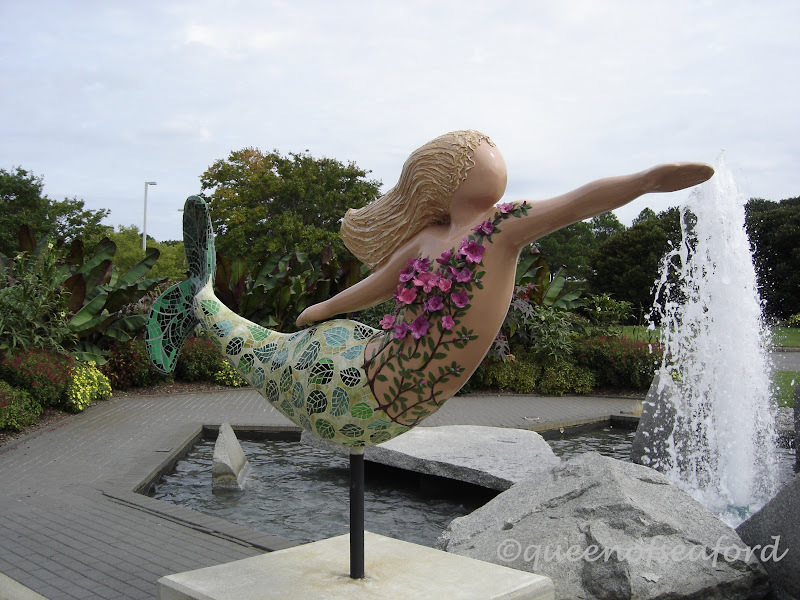 As we left one of the Norfolk mermaids bid us farewell……………. I will be back soon!